Over the last few years, rechargeable hearing aids have become a popular feature for many hearing aid manufacturers. Manufacturers are realizing that we are very comfortable charging our cell phones and laptops throughout the night, so why not our hearing aids? Rechargeable hearing aids are a great fit for many people, due to their environmental friendliness, convenience, and affordability over time. Currently, there are many rechargeable options on the market. Here, we discuss the benefits of rechargeable hearing aids and some of the most popular options currently available. With traditional hearing aid batteries, users must choose between more features and shorter battery life, or longer battery life but less features. 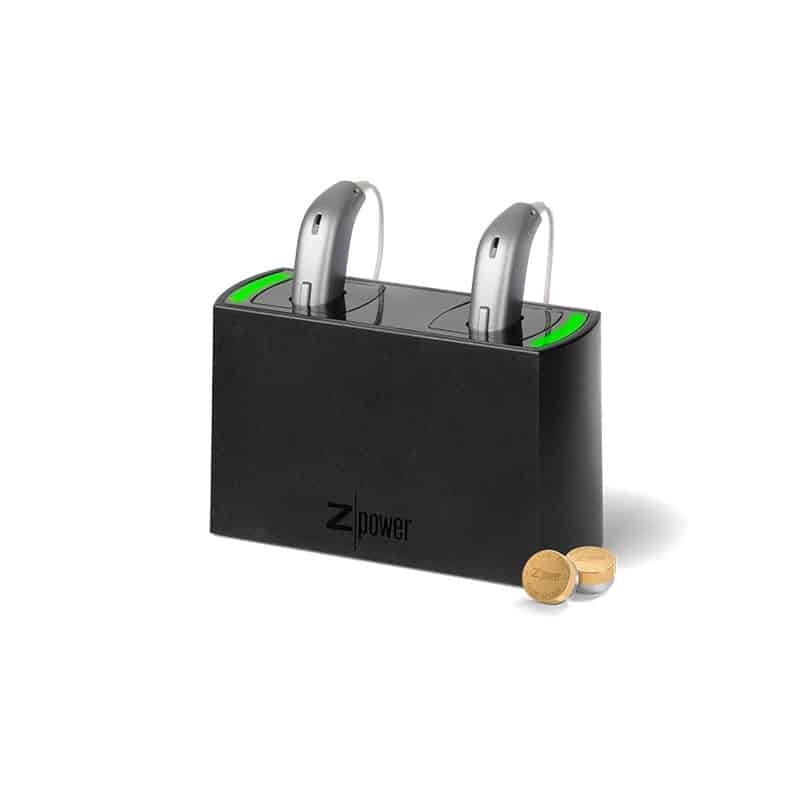 With some high-performing hearing aids, regular zinc batteries only last a few days at the most. It has been estimated that about 150 billion hearing aid batteries are disposed of each and every year. Like all batteries, zinc hearing aid batteries are not recyclable, and pose a risk of leakage. There is less upkeep cost. It has been estimated that disposable battery replacements can cost consumers up to $150 per year. With rechargeable batteries, replacements are no longer necessary – thus saving you valuable dollars – each and every year. They can be more convenient. With traditional hearing aids, one needs to remember to purchase replacement batteries before they run dry. Otherwise, users can find themselves in the middle of a business meeting or on a road trip suddenly unable to hear. With rechargeable batteries, there is no longer a need to remember to purchase hearing aid batteries – instead, you simply charge overnight. If you do find yourself out of a charge, most rechargeable hearing aids also allow disposable battery usage in a pinch. 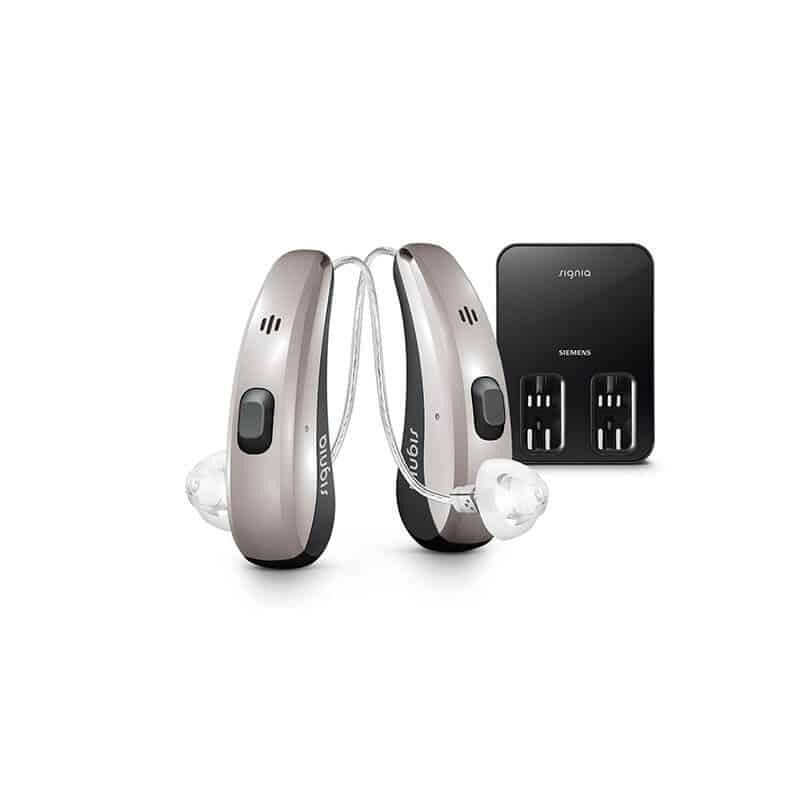 The Opn is Oticon’s newest, most powerful and most popular hearing aid. Now, the miniRITE model is now rechargeable. The Opn offers many great features such as BrainHearing™ technology – that has been scientifically proven to decrease listening effort in noisy environments as well as direct streaming capabilities with Apple devices. Opn miniRITE hearing aids will last all day with an overnight charge. If you forget to charge, simply switch to disposable batteries for the day and continue to enjoy the many benefits of the powerful Opn system. Signia’s Pure™ Charge&Go hearing aids use high-capacity lithium-ion batteries and revolutionary wireless charging capabilities. With wireless charging, users don’t need to worry about exact placement in a charging port, and have less risk of dirt and debris getting into their hearing aids because there are no electrical contacts. With the Charge&Go, users can enjoy 19 hours of use time without audio streaming and 16.5 hours of Bluetooth streaming on one 3-hour charge. Like the Phonak options, if you are short on time, a 30-minute charge will give users 6 hours of use. 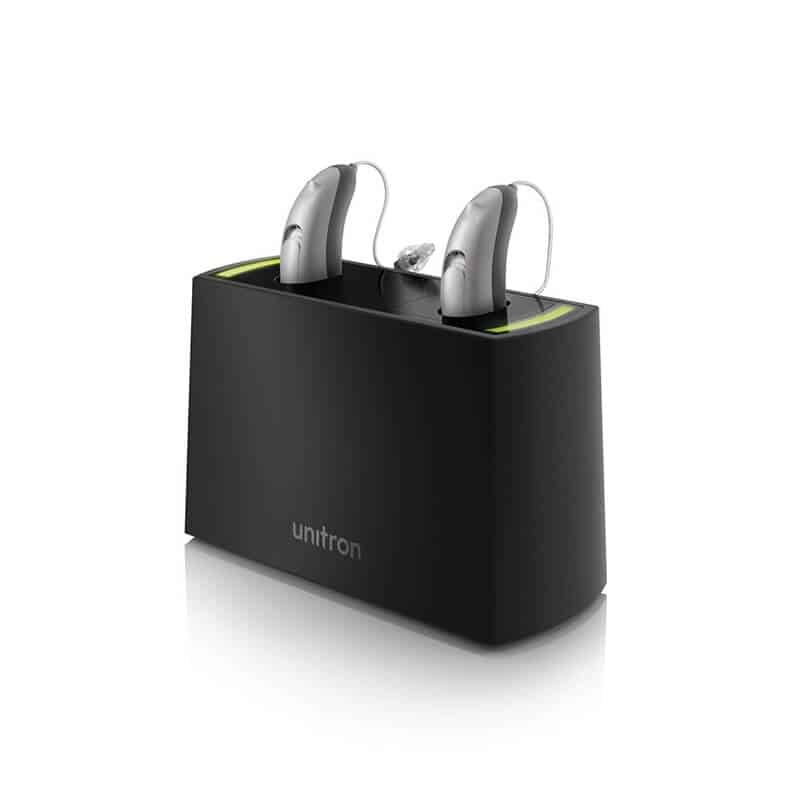 While Unitron offers multiple rechargeable options, their Moxi All R is their newest and most revolutionary. What makes these hearing aids so special is they offer direct streaming connectivity with any Bluetooth enabled device, including Android and even simple cell phones. The Moxi All also offers five different technology levels, meaning there are more price points and therefore more accessibility. An overnight charge allows for a full day of conversations, including truly hands free calling on any phone. 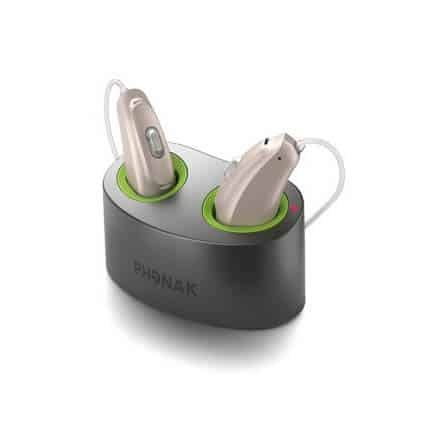 Phonak is a leading manufacturer in rechargeable hearing aids. They currently offer rechargeable solutions for four of their series, the Audéo™ B-R, Bolero™ B-R, Naida B-RIC and their children’s Sky B-PR. What makes Phonak rechargeables stand out is there super-fast charging capabilities as well as their “power pack”. With Phonak products, you get a full day’s charge (24 hour use) with just two hours of charging time. If you find yourself in a time crunch, just 15 minutes of charge time will give you three hours of hearing aid use. With Phonak’s power pack, you can still charge your hearing aids, even without access to a power outlet. Of course, Oticon, Phonak, Signia and Unitron are not the only manufacturers to offer rechargeable hearing aids. In fact, all of the manufacturers we represent have rechargeable options, including Starkey, ReSound and Widex. Navigating the world or hearing aids can be overwhelming, and rechargeables may not be right for everyone. We are here to help. Reach out to our friendly team today to learn how we can help you in finding the perfect hearing aid to meet your unique needs.